HealthyLine Infrared Heating Pad | Back Pain Relieve Sore Muscles, Joints, Arthritis | Medium 32″ x 20″ | Negative Ions | Jade & Tourmaline Stones | Free Thermal Blanket | US FDA by HealthyLine at HQ Health Blogs. MPN: 014B-LIGHT-JT-BLK. Hurry! Limited time offer. Offer valid only while supplies last. Relieve sore joints, tired muscles and painful arthritis with an infrared heating pad that promotes healing with deeply-penetrating negative ions. Relieve sore joints, tired muscles and painful arthritis with an infrared heating pad that promotes healing with deeply-penetrating negative ions. Getting older means going through aches and pains that seem to linger no matter how much you rest them or take pain killers. That's why you need a safe, natural way to treat sore muscles and joints; the HealthyLine Infrared Heat Therapy Mat . Fitted with jade and tourmaline gems, this heat pad offers flexible support that helps heal your entire body with deeply-penetrating negative ions. These healing gemstone mats are EMF free and radiation free and use safe, natural stones to provide your body the right amount of purifying heat for relaxing comfort. Great for shoulders, muscles, your lower back, neck, and so much more; you'll love how much better your body can feel with just a few quick, simple treatments. Click 'Add to Cart' to get the HealthyLine infrared heating mat and start relieving aches, pains and soreness with powerful negative ion healing. 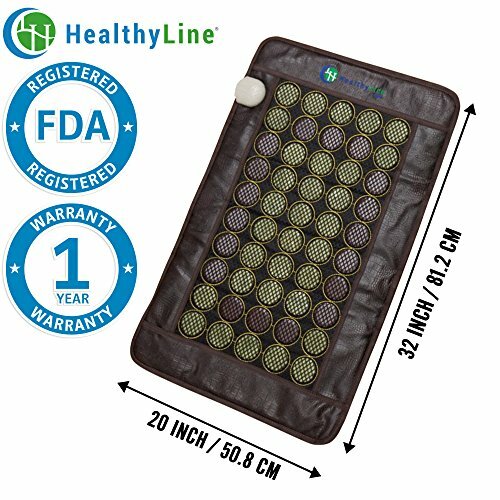 UNIQUE HEALTH BENEFITS - HealthyLine professional natural stone heating infrared pad is a healthy alternative to medicine and an effective solution for your chronic back pain, arthritis or depression. Designed with your comfort and pain relief in mind, this premium heating therapy pad is comfortable, but also extremely beneficial for both your body and spirit. FAR INFRARED RAYS - (FIR) are able to penetrate deep into the outermost regions of the tissues, muscles and bones. One hour of far infrared therapy can burn up to 900 calories, showing real results in breaking down trapped fat, waste, cellulite and other forms of toxic substances. HEALING GEMSTONES - Each flexible heat therapy pad is crafted with natural jade and tourmaline stones to provide comfortable, soothing pain and tension relief. Health benefits of Jade include relieving back pain, deep muscle tissue pain, hypertension, arthritis pain, improving heart, lungs, and thymus health. GEMSTONE THERAPY - In addition to the benefits of Jade, Tourmaline is a semi-precious mineral that emits far infrared radiation which boosts the immune system and promotes detoxification. Other health benefits include fat loss support, improved blood circulation and overall healthy mood. ADDITIONAL BENEFITS - HealthyLine products are safe, effective and FDA registered to provide reliable support. Along with a safe shut-off timer, our heating pad offers a built-in LED controller for desired temperatures up to 70°C (160°F).